The ability to create recurring services is a powerful feature of ServiceTrade. To do so, first navigate to the location page for which the service will be for. Once there, click the green "Create a New Service" button to the right. This will open a box with options for the service. Asset to Service - assign this service to a particular asset at a location. Service Line - select the type of service. Description - enter a clear description of the work to be completed. Preferred Techs - select which tech(s) to auto-assign whenever possible. Estimated Price - an estimate of the price of the service. Estimated Duration - the estimate of time it will take to complete the service. Scheduling Window - the size of the window in which to schedule the service. Once this is complete, you will need to set the frequency of the service. You can set a recurring service to repeat on a daily, weekly, monthly or yearly basis. As an example, if are looking to schedule preventative maintenance to repeat every quarter, you will set a monthly frequency. 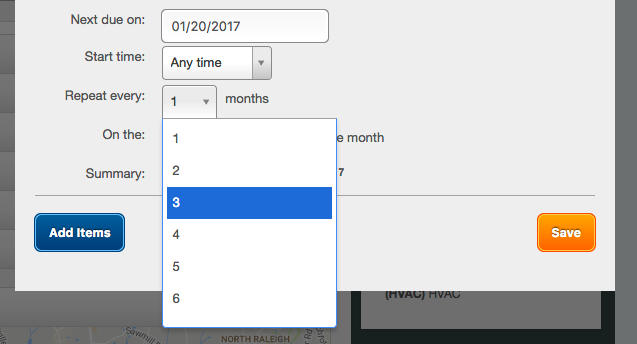 Selecting "Monthly" will then allow you to choose how many months should pass between service appointments. If you select single day delivery window, you will have the option to specify a preferred start time as shown below. This is not available if choosing any other service delivery window. Set a start date and time and you will then get a summary of the service. If this is correct, clicking save will create the service and display it on the location page. The Service Opportunities Report. This report allows you to review your recurring services that are coming due for a given time period and to act on each. All service opportunities should be acted on, and there should be no service opportunities for any given time range that you are preparing to schedule. 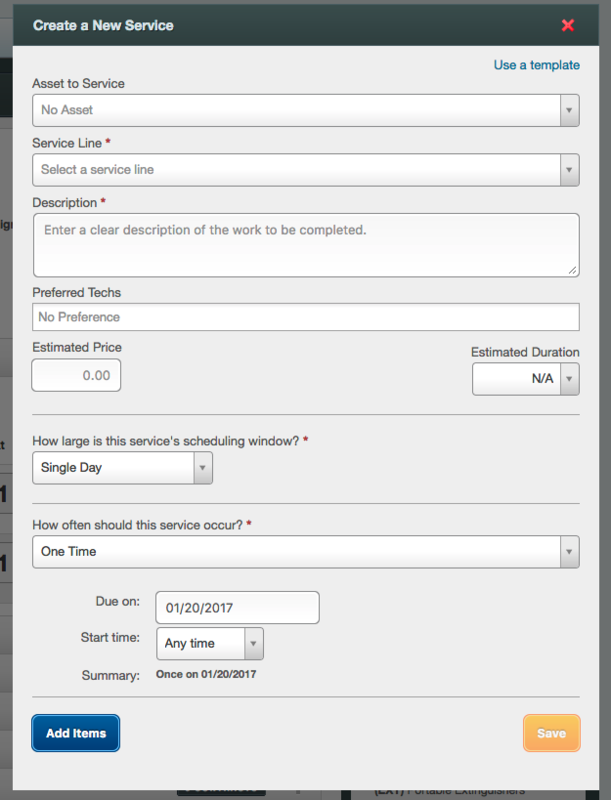 "Add job" buttons on the location page and scheduler will suggest upcoming service opportunities. If you add jobs this way (one at a time), be careful to use the correct service opportunity. Be equal careful not to use a service opportunity / recurring service if you did not intend to (example - a one-off repair, rather than a quarterly PM job). The next due date of a recurring service seems incorrect. The first start date, repeat frequency and interval are all found by editing the recurring service itself from the location page. We never change the service cycle automatically. Only a person editing the recurring service itself can change the cycle. Imagine a semi-annual service is due Jan 1, then July 1. You created a job from the recurring service but did not do the work until Feb. The next due date remains July 1. Again, we do not change the recurring service cycle. I completed a job and my recurring service did not advance the due date. This is only possible if the service on your job did not come from a recurring service, or was an earlier instance of a recurring service. Proper use of the Service Opportunities Report will assure that this problem does not occur. How do I schedule 3 quarterly inspections/services and an annual? We recommend in these cases that you create a quarterly service (will occur 4x per year) and a separate annual service. The Annual Job will contain both a quarterly and an annual service. It should be understood that the annual is a superset of the quarterly, and both services should be marked complete during the job. How do I move a recurring service from one location to another? There is not a way to do this. Instead, you will need to delete the recurring service from location 1 and create it again on location 2. To make commonly used service creation much faster, consider using service templates. Can techs see estimated prices on services? No. They are for office use only?